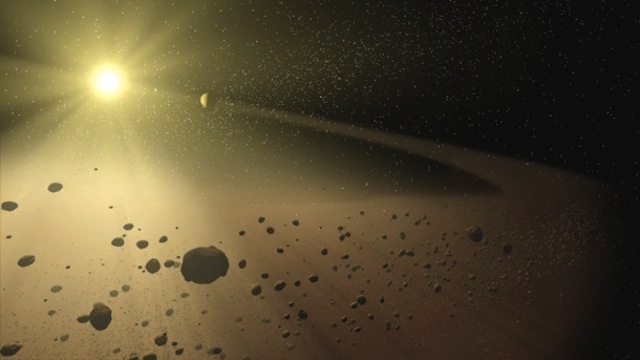 Whirling lumps of cold space rock could one day help power our economy. Really. That’s where the newly formed Planetary Resources comes in. You probably haven’t thought too much about asteroids since videogames were played in pizza parlors rather than on phones. (Can you imagine?) But now you should. Here’s why. An asteroid is basically a small chunk of material that’s in orbit around the sun somewhere closer than Jupiter. Too small and in too weird of an orbit to be considered a planet, too big to be disregarded as an irrelevant boulder, these millions of chilly lumps wander through our solar system, lonely chunks of dead rock. But they’re not all just rock. Some are loaded with carbon-rich compounds, some have water, some are loaded with metals. In other words, they’re rich resources just sitting there in space waiting to be mined. And that’s why the newly formed Planetary Resources will be revealing its 10-year plan to do exactly that later today. The asteroid 16 Psyche is estimated to contain 170 million trillion tons of nickel-iron, or enough to supply our global needs for millions of years. How much useful material is out there is astonishing. A famous 1997 publication, “Mining the Stars,” suggested that at that year’s prices, a small metallic asteroid only a mile across could contain the equivalent of $20 trillion of precious and less-precious metals (equating to about $28 trillion in today’s dollars). To put that in contrast, the entire GDP of the U.S. for 2010 was just under $14.6 trillion. The asteroid 16 Psyche, about 125 miles across and one of the biggest in the asteroid belt, is estimated to contain 170 million trillion tons of nickel-iron, or enough to supply our global needs for millennia. Other asteroids contain manganese, nickel, molybdenum, and cobalt–all useful for industrial purposes. And then there’s gold, palladium, platinum, rhodium…the last of these precious metals is currently trading at around $1,350 per troy ounce (about 31 grams, or the same weight as around 8 sugar cubes). Precious metals like this have their own value in our economy, and they and other rarer minerals are powering our current explosion in technology. Rare earth elements, for example, are so rare and so politically contentious that people are desperately trying to develop alternative solutions. That’s why some long-standing ideas about exploring space involve a visit to the asteroids, because instead of having to construct a spaceship on Earth, using up our precious resources and energy to haul it all up out of Earth’s gravity into orbit, we could send a small ship to an asteroid to access its contents. Water could be extracted to provide oxygen and hydrogen, and even to act as fuel itself, minerals coud be extracted and turned into metals for construction…and a bigger ship could evetually sail on from the asteroid. This is not just the stuff of science fiction like Red Dwarf, NASA really has a plan to try to do this. The problem is how to mine an asteroid. Mining on Earth is complicated and deadly enough, without having to worry about maneuvering hundreds of tons of mining equipment into close proximity with a very irregularly shaped body, fastening yourself to it, establishing a base, and then operating complex mechanisms in the cold and threatening environment of space. Assuming you can get a spaceship to an asteroid, processing its secret hoard on-site like this makes great sense–you only need to return a small amount of payload versus much more mass of unprocessed rock, and that reduces your fuel requirements. But you do need to send up all the machinery needed to break into the rock, refine it, and process it. This is expensive and tricky, and creates many more opportunities to have a mechanical failure millions of miles from home. This task is something you’d probably be able to manage more easily with a manned mission, although it would be a very long-duration and lonely one. A safer bet is to send up a less complex rig that jets up to an asteroid, mines useful-sized chunks of it, and then sends them home individually. Less machinery to go wrong, less demands on the actual mining task, and you could do it robotically…but perhaps with more complications in returning the raw mined material. There’s another even simpler idea, more quaint, less expensive and totally within the reach of our robotic technology even as it stands today–given enough of a cash injection. It involves using some of the ideas we’ve developed to protect ourselves from the kind of asteroid impact that could kill life on Earth: Instead of sending up a mining ship to an asteroid, you simply target one and send up a rocket. The rocket arrives at the rock, attaches itself, spins the rock into the right direction and fires its engine. It doesn’t have to be a rocket with the traditional fuel-burning engine, either–it could be an ion thruster that jets out electrically accelerated gas, or perhaps a solar sail. What you’d be doing, over a longer period of time, would be bringing the asteroid closer to home in a very controlled manner, perhaps dropping it off in a “parking orbit” around the Moon. Then we’d be able to access it with relative ease, sending manned missions to it from Earth-orbiting space stations, mining it over time as its resources were needed, managing the process carefully, and dealing with problems as they occur. If you find this idea improbable, check out the clip below: It shows the asterod Lutetia, visited by the European spacecraft Rosetta in July 2010. Rosetta whizzed past, just 2,000 miles away from the 62 mile-wide rock, but you get the general idea. The opportunites for mining an asteroid are, frankly, mind-boggling. But the implications of asteroid mining aren’t exactly straightforward, and the politics are certainly lagging behind the science. Sure, there’s a ton of natural resources up there in space just waiting to be accessed. But the production of industrial minerals and metals on Earth is already a huge and proud industry that helps finance many a national GDP. What happens if an independant body suddenly starts supplying pure space-iron by the megaton? Prices will collapse, governments will get angry, scuffles may break out. And that’s just talking about iron. What happens if a space prospector using Planetary Resources technology brings back tons of gold? Perhaps no one should point out to James Cameron that there’s a diamond the size of Jupiter sitting in space just 50 light-years away. Update: Planetary Resources has officially revealed its plans now, at an event in the Museum of Flight in Seattle. Couched in some hugely positive language, Peter Diamandis and other team members revealed that they’re building a fleet of vehicles to achieve their goal–with the first launch planned for just 24 months from now (a hugely ambitious timeframe). The Arkyd 100 series will be Earth-orbit commercial space telescopes to begin the “prospecting” job of spotting near-Earth asteroids that are likely candidates. The Arkyd 200 series will extend this mission out of low orbit, and the Arkyd 300 series will survey asteroids up close. Their asteroid capturing plan seems manyfold, with some larger asteroids perhaps being strip-mined, other smaller ones captured in a shroud and sent back for processing. The goal is to boost the economy of Earth by bringing the “solar system within the economic sphere of influence” of us down here, and also to protect Earth’s precious resources.